If you don't already know Israeli actress Gal Gadot, you will soon enough. She plays Wonder Woman in "Batman v Superman: Dawn of Justice", and she'll star in two sequels: "Justice League" and "Wonder Woman" (as the title role in the latter). Gadot is also the face of the fragrance Gucci Bamboo (buy it here), as well as the new Gucci Bamboo Luxury Purse Spray, $39, which looks like a chic little weapon -- something Wonder Woman would tuck into her belt. And the travel spritz suits the real Gal Gadot's jet-setting lifestyle perfectly, as well. We caught up with the actress right after she finished an around-the-world press tour for the Batman movie. In her everyday life, she admits to being a true beauty minimalist ("when I'm on the red carpet, I'll wear lipstick -- otherwise, I only ever wear balm," she says), which gives her more time to spend with her young daughter. 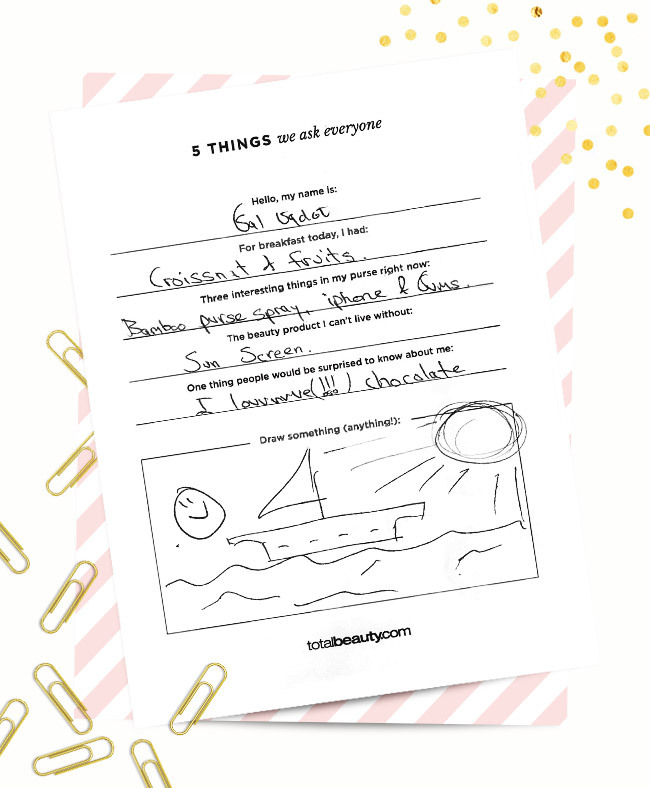 Gadot took a minute out of her hectic schedule to answer our "Five Things" questionnaire and give us a peek inside her (extremely light) makeup bag. One thing people would be surprised to know about me: I loovvvvve(!!!) chocolate.